A good trim and versatile boat is something that not only delights the kid in all of us, but it excites the explorer as well. There is maybe no better blend of reasons to get outside than a proper vessel, a place to go, and a challenging route to get there. To this end, Angus rowboats has an answer with their latest RowCruiser, a tight little pocket row boat with kayak lines and a trimaran rig with main and ketch, full batten, Chinese Junk-style sails. This is really a boat designed by people who know and understand boats. And it’s quite light as well, put together with stitch and glue construction, which means the wooden boat is held together with fiberglass strips and epoxy at the seams. The absence of hardware creates a lightweight, streamlined and integral hull. It’s good stuff, for certain. The mini cabin is great as well, and most importantly it doubles as a fine cargo hold for those most epic of adventures to discover new lands. 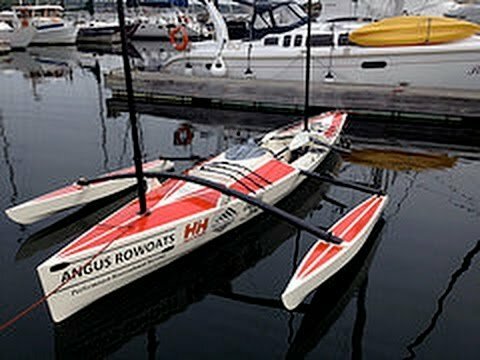 In fact, the rowing feature on the boat, combined with sail power, places it in a sold camp with Viking ships. Those hearty Norsemen would set out with 100 such boats, crashing across the wind with their square rigs, oars in concept, adding knots to their clip. It was normal for them to lose 10 boats on each trip, but that was all part of the deal. Now, with the RowCruiser, you can turn an otherwise simple weekend outing into a Saga fit for the lodgers in Valhalla. Did we mention the plumb bow? Also known as a destroyer bow, it sits perpendicular to the water, allowing for added waterline and as a result, greater hull speed. Really, if you’re going to go for a smaller, row-able boat, why not get one with sail power as well, a mini cabin/stowage, and proper lines and construction. If you’re going to voyage, then voyage in grandeur. Or at least grandeur you can hang in your garage later on.